CF Industries Holdings Inc (CF) is a manufacturing and distributor of fertilizer around the globe and the second largest producer of nitrogen fertilizer globally and the number three largest producer of phosphate fertilizer of all public companies. Further, the company is operating and owns a world-scale nitrogen and phosphate plants. CF Industries produces nitrogen fertilizer which is vital for healthy plant growth and for yielding high crop, especially for corn, cotton, and wheat. Phosphate fertilizer helps plants generate necessary sugars, germinate seeds, and build strong root structures. Nitrogen is also produced for industrial and environmental applications. Custom fertilizer products include Aqua Ammonia, UAN with Sulfur, DAP – Turf grade, and others. Man-made fertilizers have had a great influence on farm productivity and food availability. The CF Industries organization is headed by a team of executives who have a great experience building and growing successful companies. These executives are supported by more than 2,400 CF Industries employees at the company’s headquarters, manufacturing, distribution, and other locations. W. Anthony Will, President, and Chief Executive Officer, CF Industries Holdings, Inc.
Anthony Will has served as the president and chief executive officer and as a member of the board of directors of CF Industries Holdings, Inc. since January 2014. Mr. Will joined CF Industries in 2007 as the company’s first vice president, corporate development. He was promoted to vice president, manufacturing and distribution in 2009 and senior vice president, manufacturing, and distribution in 2012. He has also served as the chairman, president, and chief executive officer of Terra Nitrogen GP, Inc. (TNGP), a wholly-owned subsidiary of CF Industries Holdings, Inc. and the sole general partner of Terra Nitrogen Company, L.P., a publicly-traded producer of nitrogen fertilizer products, since January 2014. He has been a member of the TNGP board since 2010. Prior to joining CF Industries, Mr. Will was a partner at Accenture Ltd., a global management consulting, technology services, and outsourcing company. Earlier in his career, he held positions as vice president, business development at Sears, Roebuck and Company and vice president, strategy and corporate development at the Fort James Corporation. Prior to that, Mr. Will was a manager with the Boston Consulting Group, a worldwide management consulting firm. And also an M.M. degree (M.B.A.) from the Kellogg Graduate School of Management at Northwestern University. He serves on the board of directors and the executive committee of The Fertilizer Institute and is a member of the Business Roundtable. Kelleher joined CF Industries in August 2011. Prior to that, he had been vice president, portfolio, and strategy for BP’s upstream business. Earlier, he served as a chief financial officer for Pan American Energy, LLC, and in other financial positions in the operations of BP PLC and Amoco Corporation. And has a Bachelor’s degree in accounting from the University of Illinois and an MBA from Northwestern University. The analysis below was created as your value investing guide. The table above shows that the current ratio was averaging 2.31 and the quick ratio was averaging 1.84. The rule of thumb is 2.0 and 1.0, respectively. It indicates that the company has the capability of meeting its short-term financial obligations when the due date comes. On the other hand, it tells us that CF Industries Holdings Inc has strong liquidity. The current ratio and quick ratio in 2010, went down by 47 percent, due to the acquisition of properties. Moreover, the solvency ratio was averaging 48.93. It shows that CF Industries Holdings Inc is able to sustain $0.49 for every $1 total debt. The highest ratio was in 2008, and the lowest was in 2010. The leverage ratio was averaging 14 percent, total debt was 14 percent of the shareholders’ equity. CF Industries has the ability to pay its long-term financial debt. On the other hand, financial leverage was averaging 1.87 or 187 percent. This is the percentage of assets against the shareholders’ equity. Overall position, CF Industries Holdings Inc has a solid financial position. CF Industries has an acceptable gross margin, operating margin, and net margins were averaging 39.58, 36.0 and 20.74 percent, respectively. Although the ratios are somewhat erratic in movement, overall, the ratios increased by 47, 49 and 64 percent, respectively. The company has not suffered any losses from the last 5 years of its operation. Overall view, CF Industries is financially stable and sound. The cash flow margin was stable, averaging 0.88 percent. The ratios were erratic in movement. Free cash flow has an average of $12 million. On the other hand, the operating cash flow was lower in 2010, due to the purchased of properties, as mentioned earlier. CF Industries Holdings, Inc has not suffered any negative ratios and negative cash flows. It tells us that the company was profitable. Enterprise Value (EV) is the first step in this valuation. The concept of enterprise value is to calculate what it would cost to purchase an entire business. In other words, the Enterprise Value (EV) is the present value of the entire company. EV takes into account the balance sheet, so, it is a much more accurate measure of a company’s true market value than market capitalization. Significantly, it assesses the value of the productive assets that brought about its product or services, both equity capital (market capitalization) and debt capital. The enterprise value of CF was averaging $807 per share and the market capitalization was averaging $817 per share. The total debt was 16.22 percent and the cash and cash equivalent was 14.59 percent of the enterprise value, therefore, buying the entire business of CF, the investor would be paying 98.37 percent of equity and 1.63 percent of its total debt. In addition, the takeover price to date, February 25, 2014, was $14.73 billion at $241.43 per share. The market price to date was $242.79 per share. In the calculation, the enterprise value was used because it takes into account the balance sheet, so it is considered a much more appropriate measure of the company’s true market value rather than the market capitalization. Let us walk through the margin of the safety table. The margin of safety was averaging 74 percent and the intrinsic value was averaging $1,376 per share from 2009 to 2013, respectively. It indicates that it has a greater margin of safety against future uncertainty and a greater stock’s resilience to market downturns. Here is the calculation for the intrinsic value. EPS, the company’s last 12-month earnings per share; G: the company’s long- term (five years) sustainable growth estimate; 9: the constant represents the appropriate P-E ratio for a no-growth company as proposed by Graham (Graham proposed an 8.5, but I changed it to 9); 2: the average yield on high-grade corporate bonds. On the other hand, the sustainable growth rate (SGR) is a measure of how much a firm can grow without borrowing more money. Here is the table for the sustainable growth rate. The sustainable growth rate was averaging 29.05 percent and the return on equity was averaging 27.52 percent from 2009 to 2013. Further, the payout ratio was averaging $5.84 from 2009 to 2013. Furthermore, the ROE was lower in 2010 where the company suffered its lowest positive net earnings in the last five years and this is the year they had invested in property and equipment. And also,, the CF payout ratio was high in 2010. The Return on equity (ROE) is an indicator of a company’s profitability by measuring how much profit the company generates with the money invested by common stock owners. The historical summary of the Benjamin Graham method above can be viewed in the table below. The margin of safety was lower in 2010, so as to the intrinsic value, however, during the succeeding periods, 2011 and 2012 it went up by 886 and 30 percent, respectively and in 2013 it decreased by 19 percent. Moreover, the sustainable growth rate was also low in 2010 but managed to increase the succeeding periods. It shows that CF was profitable. This valuation will determine whether the stocks are undervalued or overvalued by multiplying the Price to Earnings (P/E) ratio with the company’s relative Earning per Share (EPS) and comparing it to the enterprise value per share, we can determine the status of the stock price. Below is the calculation for the P/E*EPS valuation. 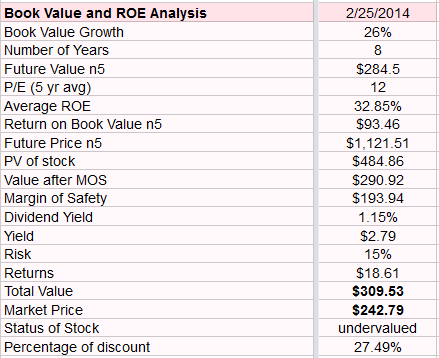 Overall, the P/E*EPS indicates that the stock of CF was trading at an undervalued price because the P/E*EPS ratio was higher by 1 percent of the enterprise value. This valuation shows the relationship between the stock price and the company’s earnings. The price to earnings is the price that the market is willing to pay for the company’s earnings. The price to earnings of the company can change daily as the market price changes. This EV/EBITDA metric is used in the valuation of the business. This metric used to compare the value of the company with its debt and other liabilities to its actual cash earnings, not including non-cash disbursements. In addition, it is applicable in analyzing and comparing profitability between companies and industries. As a result, this gives us an idea of how long it would take the earnings of the company to pay off the price of buying the entire business, including debt. The EV/EBITDA valuation indicates that it will take 5 times the cash earnings of CF to recover the costs of buying the entire business. In other words, it will take 5 years to recover the purchase price of buying the entire business. The table below is the summary of the five years of historical data on CF Industries Holdings Inc. The above financial ratios will give us a view of the 5-year historical trend in the company’s operation. As seen above, the book value increases from 2008 to 2012; however, in 2013, there was a 5 percent decreased in value. Further, the price to earnings was erratic in movement. Furthermore, the earnings per share and the return on equity shows a decreased in 2009 and 2010, and an increased of 196 percent in 2011. This approach is the historical book value growth analysis plus the return on equity analysis. The 5 years historical Price to Earnings, the current dividend yield, and the current market price was factored. In addition, the percentage of risk was 15 percent. It determines whether the stock is over or undervalued. The book value growth of CF Industries was 26 percent with its historical data of 5 years. The calculated future book value at year 5 was $284.50 per share. And also, the return on book value at year 5 was $93.46. In addition, the future price in year 5 was $1,121.51 per share. The calculated present value of the stock was $484.86 per share. Finally, the stock of CF Industries Holdings, Inc was undervalued at 27.49 percent as of February 25, 2014. The company has a solid financial position, a reasonable level of debt and a notable return on equity. The company’s market price increased by 1,437 percent from the time it started its IPO in 2005 up to the trailing twelve months of 2014, at $16.20 to $249.05 per share. Finally, the stock price was trading at an undervalued price. Therefore, a BUY is best recommended for the stock of CF Industries Holdings Inc (CF).